We have published thousands of coffee reviews and espresso reviews since 1997. The reviews below appear in reverse chronological order by review date. You may refine your search by key word or category using links to the right. Older reviews may no longer accurately reflect current versions of the same coffee. Fruit-forward, richly chocolaty. Raspberry coulis, chocolate fudge, brandy, cedar, mace in aroma and cup. 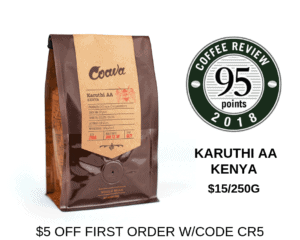 Sweet-tart structure with gentle, rounded acidity; full, creamy mouthfeel. Fruit-toned finish: think berries enveloped in chocolate, with a hint of mace in the long. Evaluated as espresso. Rich, chocolaty, sweetly tart. Dark chocolate, peach, Szechuan peppercorn, orange zest, myrrh in aroma and small cup. Smooth, satiny mouthfeel; resonant, chocolaty finish. In three parts milk, notes of Szechuan peppercorn and dark chocolate harmonize sweetly, with undercurrents of peach and myrrh. Spice-toned, complex, richly bittersweet. Blackberry, dark chocolate, blood orange zest, ginger blossom, oak in aroma and cup. Bittersweet in structure with bright, high-toned acidity; plush, syrupy mouthfeel. The resonant finish is redolent with notes of cocoa-toned blackberry and spicy ginger blossom. High-toned, balanced, crisply sweet. Apricot, tangerine zest, dark chocolate, honey, rhododendron in aroma and cup. Sweet-tart structure with juicy, bright acidity; buoyant, syrupy mouthfeel. The rich finish is centered around notes of dark chocolate and tangerine zest, with vanilla-toned florals. Delicate, fruit-toned. Dried strawberry, brandy, dark chocolate, cedar, pink peppercorn in aroma and cup. Sweet-toned in structure with gentle, round acidity; lightly syrupy mouthfeel. Sweetly fermenty in the finish with notes of berry liqueur and pink peppercorn. Crisply sweet-savory. Toffee, black cherry, rosewood, walnut, violet-like flowers in aroma and cup. Richly bittersweet structure with juicy acidity; satiny-smooth mouthfeel. The crisp finish consolidates to notes of black cherry and walnut. Bright, crisply sweet, chocolaty. Lemon blossom, nougat, roasted cacao nib, pomegranate, violet in aroma and cup. Balanced, sweetly tart structure with juicy, bright acidity; satiny-smooth mouthfeel. The resonant finish centers around cocoa and lightly-expressed citrus notes. Wild, unruly, utterly brilliant and original. Intensely and intricately floral-toned: opulent lily through delicate violet with a shifting bouquet of possibilities between. At the heart of aroma and flavor is a cidery, brandyish compote of fruit–apple, passion fruit, lychee–rounded by a fine, cocoa-toned chocolate. The structure is shifty, simultaneously sweet, crisply bitterish and tart, the mouthfeel plump and syrupy. The finish rings on with continuing layers of fruit, flowers, cocoa and coconut. Floral-toned, richly sweet. Narcissus, roasted cacao nib, toffee, apricot, sandalwood in aroma and cup. Deeply sweet-tart structure with juicy, bright acidity; full, syrupy mouthfeel. Resonant finish centers around cocoa-toned narcissus and apricot. Deep, richly sweet-savory. Black currant, fine musk, toffee, jasmine, celery seed in aroma and cup. Sweet-savory in structure with bright, juicy acidity; plush, syrupy mouthfeel. The flavor-saturated finish is equal parts sweet-leaning (black currant, toffee, jasmine) and savory (musk, celery seed). Richly sweet, spice-toned. Cocoa powder, cinnamon, oak, lily, lemongrass in aroma and cup. Sweet structure with gentle, round acidity; full, velvety mouthfeel. The finish centers on cocoa and lily-like flowers with a hint of lemongrass. Fruit-toned, richly sweet. Strawberry, dark chocolate, nutmeg, grapefruit zest, fresh-cut fir in aroma and cup. Sweet-toned structure with round, gentle acidity; satiny-smooth mouthfeel. The gently drying finish centers around fresh-cut fir with strawberry and nutmeg suggestions. Fruit-toned, richly chocolaty. Dark chocolate, dried blueberry, freesia-like flowers, honey, cedar in aroma and cup. Sweet-tart structure with round, gentle acidity; full, syrupy mouthfeel. The finish consolidates to blueberry and chocolate notes, with a hint of cedar. Richly spiced-toned, deeply sweet. Dried apricot, molasses, pink peppercorn, dark chocolate, jasmine in aroma and cup. Sweet-savory structure with engaging, bright acidity; plush, syrupy mouthfeel. The short finish leads with dried apricot and dark chocolate, followed in the long by jasmine and pink peppercorn. Richly sweet, nut-toned. Baker’s chocolate, hazelnut butter, pear, agave syrup, fresh-cut fir in aroma and cup. Sweet-toned structure with brisk acidity; satiny-smooth mouthfeel. Chocolate- and nut-toned in the long, resonant finish. Delicately floral and fruit-toned. Honeysuckle, honeydew melon, lemon verbena, roasted cacao nib, frankincense in aroma and cup. Sweet-tart structure with playful, bright acidity; full, satiny mouthfeel. The richly sweet finish consolidates to cocoa-toned honeysuckle and melon. Deeply sweet, rich-toned. Apricot, baker’s chocolate, honeysuckle, oak, agave syrup in aroma and cup. Sweet in structure with brisk acidity; full, syrupy mouthfeel. The finish consolidates to apricot and baker’s chocolate, with hints of honeysuckle. Delicately opulent. Honey, lemon blossom, cocoa, fresh pipe tobacco, a hint of roasted nut in aroma and cup. Very sweet, gently crisp in structure; buoyant, almost levitating in mouthfeel. Quietly resonant, cocoa-toned in the finish. Richly sweet, spice-toned. Roasted cacao nib, tamarind, tangerine zest, freesia-like flowers, almond in aroma and cup. Sweet-tart structure with juicy acidity; crisp, satiny mouthfeel. Resonant finish centers on notes of cocoa-toned tamarind and freesia. Richly sweet, spicy, tobacco-toned. Pipe tobacco, almond brittle, ginger blossom, mango, roasted cacao nib in aroma and cup. Sweet-savory structure with gentle, rounded acidity; crisp, satiny mouthfeel. The finish resonates with vanilla-toned pipe tobacco and ginger blossom.